An Oregon community mourns after a gunman killed nine, and wounded at least seven people at a college campus. ROSEBURG, OR -- Armed with multiple guns, a 26-year-old man walked into a morning writing class at a community college in this rural Oregon town and opened fire, hitting some students with multiple gunshots. One witness said the attacker demanded to know students' religion before shooting them. Students in a classroom next door heard several shots, one right after the next, and their teacher told them to leave. "We began to run," student Hannah Miles said. "A lot of my classmates were going every which way. We started to run to the center of campus. And I turned around, and I saw students pouring out of the building." 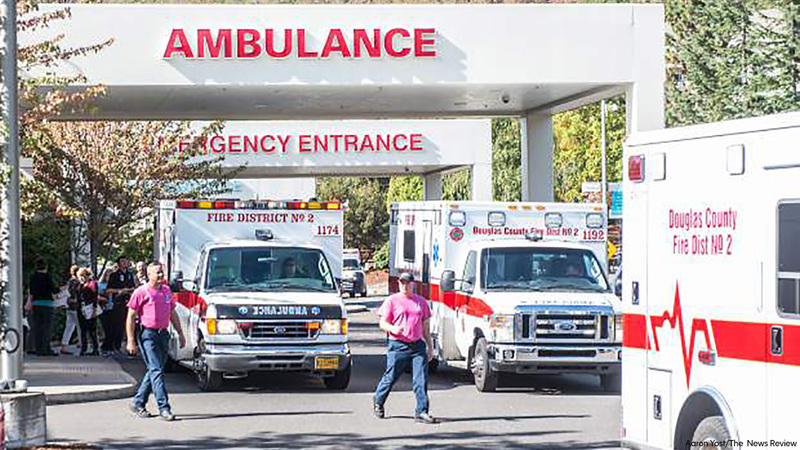 At least nine people were killed and seven others wounded Thursday, the fourth day of classes at Umpqua Community College in this former timber town 180 miles south of Portland. The worst mass shooting in recent Oregon history was raising questions about security at the college with about 3,000 students. "I suspect this is going to start a discussion across the country about how community colleges prepare themselves for events like this," former college president Joe Olson said. The killer was identified as Chris Harper Mercer, according to a government official who was not authorized to speak publicly and provided the name on condition of anonymity. Mercer died after a shootout with police, who were not saying whether they knew of any motive. He had body armor and was armed with three pistols, a rifle and five additional magazines, the Bureau of Alcohol, Tobacco, Firearms and Explosives said in an incident report obtained by The Associated Press. The guns included a 9mm Glock pistol and .40-caliber Smith & Wesson, both traced to the suspect. Mercer is not believed to have a criminal history. Investigators believe he may have been a student at the college because a receipt found at the scene showed he purchased textbooks from the campus bookstore two days before the shooting. The U.S. Army says the gunman who killed nine people at an Oregon community college flunked out of basic training in 2008. Lt. Col. Ben Garrett, an Army spokesman, said Christopher Sean Harper-Mercer was in service at Ft. Jackson, South Carolina, starting on Nov. 5, 2008. But by Dec. 11, 2008, he was discharged for failing to meet the minimum administrative standards. Garrett did not say which standards Harper-Mercer failed to meet. Generally, the Army requires recruits to pass physical fitness tests and to be generally in good physical and mental health. Recruits also must score highly enough on a multiple-choice test covering science, math, reading comprehension and other topics. He lived in an apartment complex in nearby Winchester, where investigators found a number of firearms, Douglas County Sheriff John Hanlin said Friday. Details about the number and type of guns would be released later, he said. A neighbor, Bronte Harte, told The Associated Press that Mercer "seemed really unfriendly" and would "sit by himself in the dark in the balcony with this little light." Harte said a woman she believed to be Mercer's mother also lived upstairs and was "crying her eyes out" Thursday. There didn't seem to be many recent connections on the social media sites linked to Mercer, with his MySpace page just showing two friends. His father, Ian Mercer, said late Thursday that it's been a "devastating day" for him and his family, and he has been talking to police and the FBI about the shooting. He spoke to KABC-TV and several other media outlets gathered outside his house in Tarzana, California. Step-sister Carmen Nesnick said the shooting didn't make sense. "All he ever did was put everyone before himself, he wanted everyone to be happy," she told KCBS-TV. Hanlin, the sheriff, said Thursday that he was not going to say the shooter's name because that's what he would have wanted. "I will not name the shooter. I will not give him the credit he probably sought prior to this horrific and cowardly act," said a visibly angry Hanlin. Hundreds went to a candlelight vigil Thursday night, with many raising candles as the hymn "Amazing Grace" was played. "That's all I could think about today. There's 10, 9 kids who won't get those doors opened," he said. Roseburg is in Douglas County, a politically conservative region west of the Cascade Range where people like to hunt and fish. But it's no stranger to school gun violence. A freshman at the local high school shot and wounded a fellow student in 2006. After Thursday's shooting, anguished parents and other relatives rushed to surviving students. "I don't know where she is. I don't know if she's wounded," Chandler said. Carnes' best friend told Chandler that her daughter had been flown by helicopter to a hospital. Students described utter fear and panic after hearing the shots. "I was freaking out. I didn't know what to think, what to do," she said. Before the Roseburg shooting, a posting on the message-board site 4chan included a photo of a crudely drawn frog used regularly in Internet memes with a gun and warned other users not to go to school Thursday in the Northwest. The messages that followed spoke of mass shootings, with some egging on and even offering tips to the original poster. It was unclear if the messages were tied to the shooting because of the largely anonymous nature of the site. Investigators went door to door in the neighborhoods near the college and the shooter's apartment seeking clues, Hanlin said Friday. The sheriff has been vocal in opposing state and federal gun-control legislation. In 2013, Hanlin sent a letter to Vice President Joe Biden after the shooting at a Newtown, Connecticut, elementary school, declaring that he and his deputies would refuse to enforce new gun-control restrictions "offending the constitutional rights of my citizens."